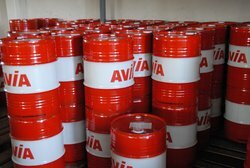 The division of AVIA lubricants produces and sells lubricants for automotive and industrial processes, with a strong specialization in custom formulations in the field of lubrication such as hydraulic, gear and guides on mineral and synthetic bases, in metal cutting, in which ranges from soluble products emulsifiable in water , semi-synthetic and synthetic , to the integral cooling lubricants for machining of steel, aluminum and copper alloys. The production of lubricants for industrial processes takes place inside of a well-established partnership with AVIA international, European leader in the production of lubricating oils. Our lubricants are formulated and manufactured according to strict quality criteria and selection of raw materials, to obtain products in line with the quality standards of AVIA International. Laboratory activities support the research and development of lubricants AVIA in synergy with AVIA partners.